If fuller lips are something you’ve always wanted, lip augmentation may be a great option for you. 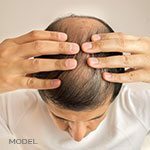 Dr. Richard Buckley does the quick and easy procedure in the office of MilfordMD in Northeastern Pennsylvania. With immediate results and little to no downtime, lip augmentation can be just what you are looking for. Lip augmentation is a procedure that uses either synthetic products or your own fat to enhance the shape and plumpness of your lips. Upper and lower lips can be treated alone or together at the same time. Very fine blunt tipped microcannulas are used, and the lips should look and feel natural after treatment. Results are seen immediately. What is used to plump lips? Dr. Buckley can use hyaluronic acid filler, such as Perlane® or Juvederm®, or he can also use a person’s own fat. With fat injections, the fat is harvested from another area of the patient’s body and purified prior to injecting into the lips. Perlane™ and Juvederm®, clear hyaluronic acid fillers, are similar to the hyaluronic acid found naturally in the body. This is the more commonly used method of filling lips. Both methods improve the appearance of lips by adding shape, structure and volume. Fat Transfer, also known as fat rebalancing, is when fat is removed from one area of the body and is then precisely placed in areas that need rebuilding, rebalancing and volume replacement. Many body areas may benefit from fat replacement, such as the lips. While lip augmentation can be done with only injectable fillers, there are advantages to also using your own fat. 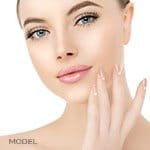 When Dr. Buckley uses the patient’s own fat to plump the lips, he typically also uses a small amount of injectable fillers as well to achieve optimal results. Perlane® and Juvederm® treatments subtly enhance your lips and offers results for six months to 12 months with just one treatment. The fillers contain lidocaine, a local anesthetic, to make your procedure more comfortable. Allergic reaction is unlikely as Perlane® and Juvederm® are made from a similar substance found in the body. A cool pack can be applied to help ease any discomfort and to control swelling, but firm pressure should be avoided. 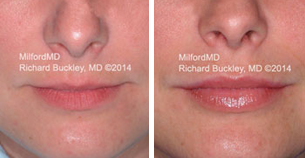 To find out if lip augmentation is right for you, call MilfordMD for a consultation appointment with Dr. Richard Buckley at 570-296-4000, at Buckley of MilfordMD Cosmetic Dermatology Surgery & Laser Center in Northeastern Pennsylvania sees many patients with eczema, and can offer different treatment options to manage eczema outbreaks, depending on the individual’s situation.